You’ve probably seen most, if not all, of the statements released yesterday in the wake of the verdicts in the McDonnells case. Nevertheless, I figured I’d post the ones I received, in case you haven’t. The jury has spoken. This is a sad day for Virginia. I have known and worked with Bob McDonnell for more than 20 years, and my thoughts today are with Bob, Maureen, and their children. I urge all Virginians to keep the McDonnell family in their prayers. This is a sad day in the history of our Commonwealth. Today’s verdict will require Congress to clarify the exact meaning of ‘honest services’ and will encourage state legislatures to adopt meaningful gift bans. My thoughts and prayers are with Bob and Maureen McDonnell and their children. I am deeply saddened by the events of the trial that ended in today’s verdict, and the impact it has had on our Commonwealth’s reputation for honesty and clean government. Dorothy and I will continue to pray for the McDonnell family and for everyone who was affected by this trial. We have a long way to go to restore the public’s trust after this embarrassing and difficult period for the Commonwealth of Virginia. If there was somehow still any doubt, it should be crystal clear that the people of Virginia deserve real ethics reform that will turn off the spigot of gifts, tickets, and trips that opens the door to abuse and undermines public confidence in our government. That’s why on the day I was sworn in I implemented a strict gift ban and ethics policy for the Office of the Attorney General. It applies to me, my family, and employees and it says no gifts worth $25 or more, no more than $100 from any person in a year, and it doesn’t distinguish between tangible and intangible gifts. In the upcoming legislative session, I hope the General Assembly will move much closer to the gift bans that Governor McAuliffe and I have implemented. This is a sad day for Virginia. I have known Bob McDonnell for a long time and consider him a very good friend of mine. He spent 38 years in public service and his record as Governor speaks for itself. I believe in the justice system and I am not going second guess the jury. The jury rendered its verdict and the McDonnells have an opportunity to appeal. That’s the way the system works. 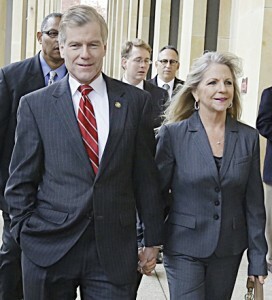 I am proud to call Bob McDonnell my friend and I pray for him and his family during this difficult time. Today is a sad day for our Commonwealth. The jury has spoken after hearing twenty-four days’ worth of evidence. The best thing we in the legislature can do is to move forward, turning our attention to the future — and to the issues that Virginians elect us to address. We should all keep the McDonnells in our thoughts and prayers, particularly their children. I joined Jim Hoeft on WVEC yesterday as a part of its verdict coverage. I’ll post a link to the video once it is available. As others have pointed out, McAuliffe was Clinton’s rental agent for the Lincoln Bedroom. Star Scientific got a product launch at the Executive Mansion. Never heard of Star Scientific or Anatabloc until the trial, so the product launch wasn’t that successful anyway. Is that ALL the “quo” in the quid-pro-quo? I personally am truly fed up with those politicians who claim “ignorance”, are full of self-righteous and greed. The law has prevailed in this situation. As a former retired public servant, you are there to serve the people and not your “personal gains and well-being”. There is a clear distinction between public and private entities. Governments are not in the business to capitalize, private entities are. Our politicians have established “quasi- governmental” entities so they can circumvent the intent of government and capitalize in personal gain. We the people must stop their foolishness by holding those who come to us for our vote, accountable for their actions and promises. We need a complete change in our political structure and makeup of government officials. We must maintain a strong government that represent the people for which they are to serve. I propose that we return to the ethics of what government was meant to be: a government of the people, for the people and by the people. Integrity, accountability and morality are essential in our form of democracy and when these attributes have been circumvented, the individual(s) must be held accountable for that breach.